Okay. So first of all...yum! These are really good, and good for you. They are also really easy to make. Recently someone said to me that I always say my recipes are really easy to make...well they are if you read the directions through. My thoughts on recipes on this blog are that I like to post recipes that are (a) really delicious, (b) good for you, and (c) simple enough to make that you will actually make them. 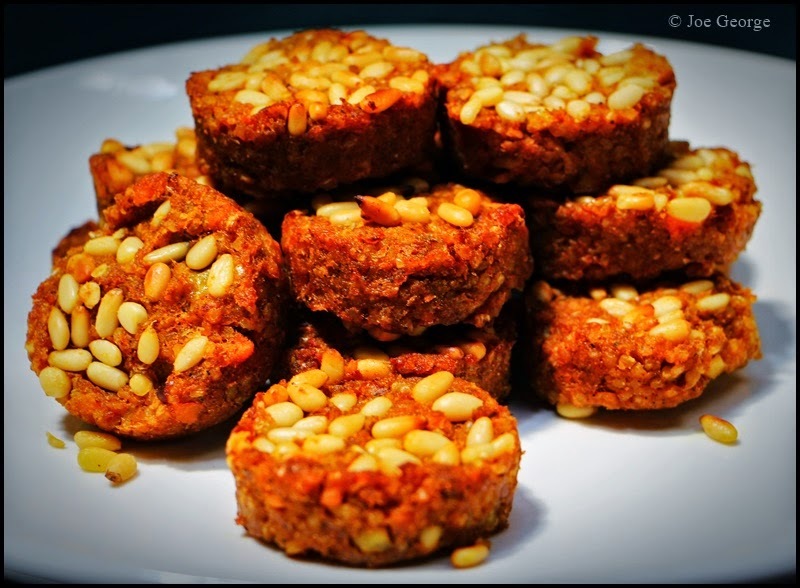 This said, this is a variation of the vegetarian version of kibbeh, which in itself can be served in many forms, but usually contains ground lamb and bulgur wheat mixed together, and is said to be somewhat of the national dish of Lebanon. A vegetarian version is one that replaces the meat with potatoes, and this recipe replaces the potatoes with sweet potatoes. Hence the variation on a variation. Anyhow, this is really easy to make and really delicious (there, I said it again), I hope you try it. 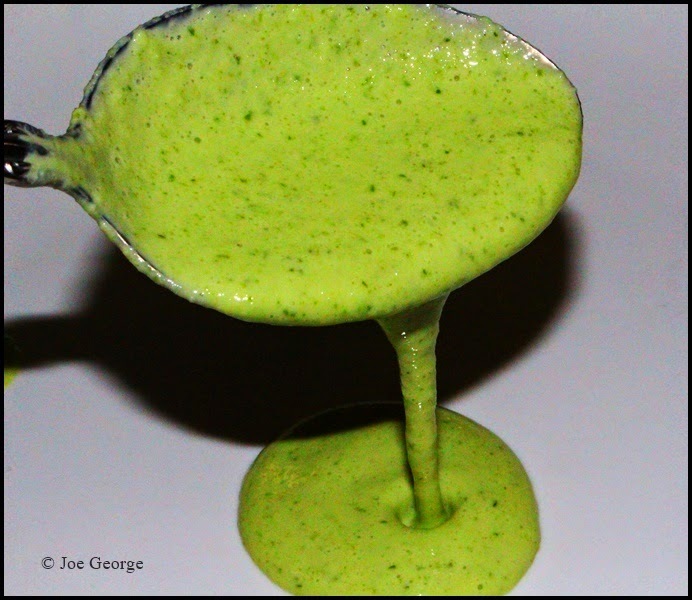 Eat it as a snack, an accompaniment to a vegetarian main course, on a salad (as I did with the below dressing), or as a sandwich such as a falafel. 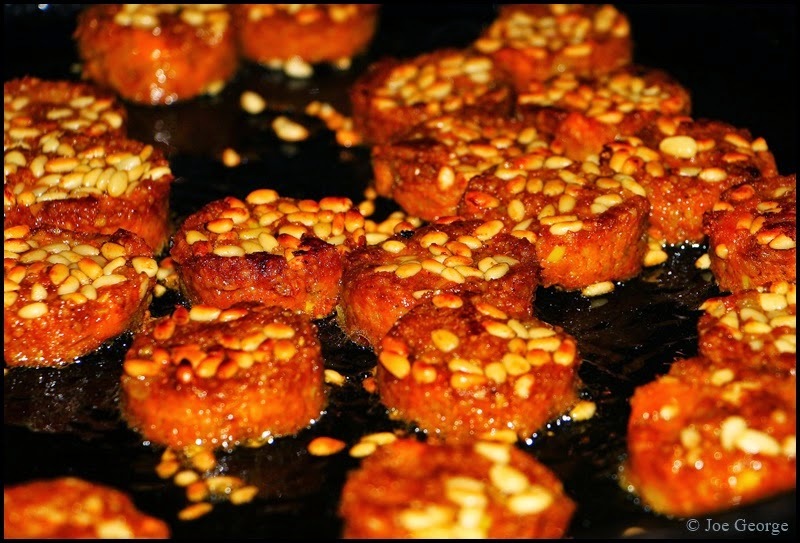 For additional Lebanese inspired recipes, click here. Accompanying recipes are below as well. Place the diced sweet potato in a small pot with enough water to cover it. Boil it for about 10-15 minutes or until very soft. Drain the sweet potato and transfer it to a bowl. Add the bulgar wheat to the bowl and mash it into the hot sweet potato. Cover the bowl and set aside for at least 10 minutes. Heat three tablespoons olive oil in a small skillet, when it is hot add the onion and saute for a few minutes or until it is lightly browned. Add the garlic and cook another minute, then stir in the seven spice mix, turmeric, and Aleppo pepper. Cook the spices for about thirty seconds, then add this mixture to the bowl with the sweet potatoes along with the sea salt and whole wheat flour. Mash the spices and flour into the sweet potatoes and bulgar wheat, cover the bowl again and allow it to rest for another 10 minutes, or until the bulgar wheat is soft. 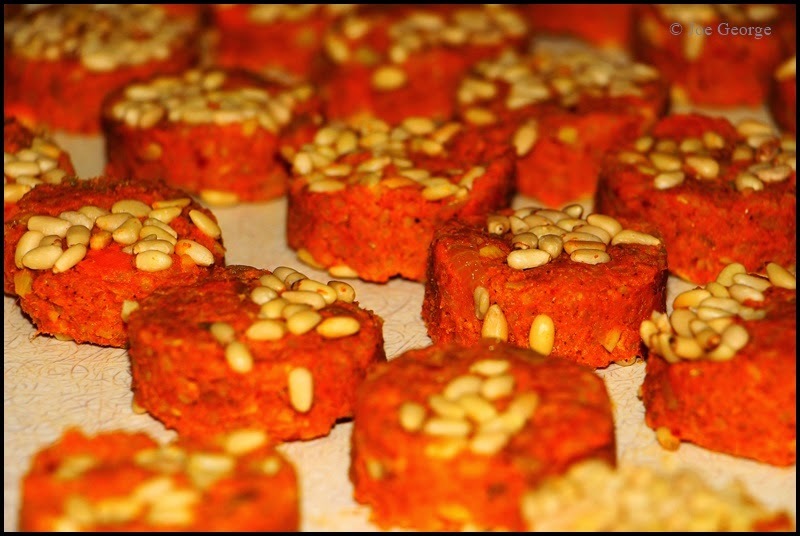 Shape the kibbeh into 1-ounce portions, pressing pine nuts into the patties. Heat a small amount of olive oil in a large skillet over medium heat. Add the kibbeh to the pan—in batches if necessary, and cook on both sides until lightly golden brown and cooked throughout.